NBC10's Randy Gyllehnaal reports as Haverford murder suspect Derrick Rollins says nothing ahead of a preliminary hearing that was continued Thursday to give Rollins more time to get a private attorney. Rollins is accused of gunning down John Le. Derrick Rollins is accused of gunning down John Le in July. Rollins is being held without bail on criminal homicide and murder charges. Rollins was given more time to hire a private attorney. The man suspected of gunning down a man in a quiet Delaware County community said nothing as he arrived to court Thursday morning. Derrick Rollins, his hands and feet shackled and dressed in a red jail outfit, faced the preliminary hearing on criminal homicide and first-degree murder charges. He is accused of gunning down John Le, 29, outside a row of three-story apartment houses in the 2300 block of Haverford Avenue. Rollins looked at NBC10's Randy Gyllenhaal but said nothing as he entered the courtroom Thursday. The hearing was continued for two weeks to allow Rollins time to secure a private attorney, a process that's underway. Rollins spent weeks on the run after the July 29 shooting before being captured outside Atlanta, Georgia in August. After Rollins was arraigned earlier this month, Le's mother Huong Le said she is praying for Rollins. "I forgive him," she said. "I just want to miss John. I just want to, my son is still alive. That’s why, because I miss him every day." Police also say Rollins fired 17 shots at a group in Philadelphia’s Overbrook Park section, injuring two men, 20 minutes before he killed Le. 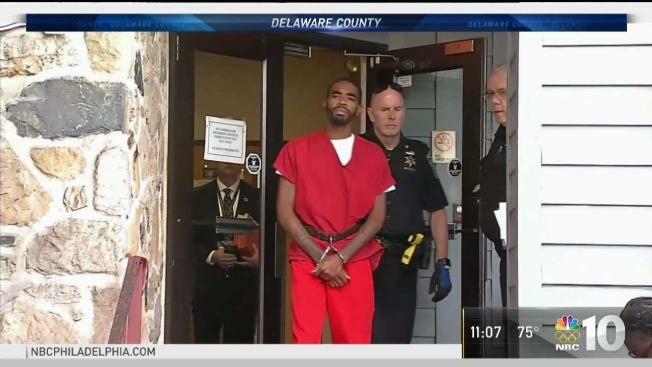 Rollins has remained jailed without bail in Delaware County.